Usually, I don’t do brand-name recipes but there is no getting around it with this recipe. 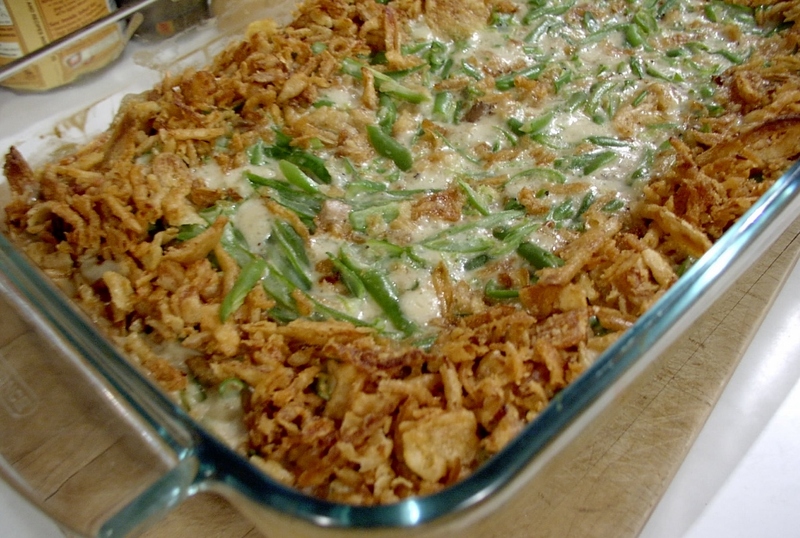 This is a recipe that has become a holiday and potluck-dish tradition in many homes. It really needs to be made more often. It seems that everyone enjoys it. Depending on which package or label you check, the recipe is just slightly different. I find this variation gives good, consistent results. I prefer the French-cut green beans to the whole green beans or the cut green beans. Bake at 350°F for 30 minutes or until hot and beans are soft. Stir. Sprinkle with the remaining onions. Bake an additional 5 minutes or until onions are browned and crisp. The cooking time given, 30 minutes, is adequate for canned or frozen beans. For fresh beans from your garden, you will need to parboil your beans for 3 or 4 minutes or until almost fork tender. You may substitute 1/2 teaspoon salt for the soy sauce. May add 1 4-ounce can sliced mushrooms, drained, as desired. Add additional onions to the top of the casserole, as desired. Sliced almonds make a tasty additional garnish. Add during the last 5 minutes of cooking.